Or Herringbone installation collage you click on any picture and it will then take you through their start to finish with our Herringbone. They used Carrara Venato 1×2″ Herringbone Honed to create this look $11.45 Sq.Ft. Along with Pencil trim $9.99EA to cap it off. A bigger picture of the finished installation of Carrara Venato 1×2″ Herringbone Mosaic Honed $11.45 a Sq.Ft. also could have been in Polished for $11.45 a SqFt. (both free shipping until the summer of 2016). Bloggers like to Blog, we like to blog. We like to blog about bloggers blogging about us. Especially if they just do it and we run across it as a customer mentions “we saw you on a blog” and of course then we have to try and find it, we are on a lot, but it is nice to find them. Post their pictures and give them the credit. This was from College Hill renovation blog. The end of an incredible year. Thank you to all our customers, I know it is not easy buying marble or products online. Many have concerns. But we have a great team and can send pictures before we ship. The savings are great, maybe looks too good, we understand that as well. But it is simple economics and supply chain management (all explained in FAQ#3). To all the 30,000 customers this year that took the plunge. Thank you! As we did not receive a single negative review and have a A+ BBB rating we did as we promised. Without our customer the retailers, contractors and home owners we would not be here. We will strive to seek ways to find new products our customers buy and lower the prices by paying cash and improving the supply chain. We will continue to focus on never loosing site of doing more with less. So pictures will still be taken with just an iPhone in 2016. Bianco Carrara 2″ Hexagon Honed $11.25 a Square Foot is used in this NYC retail clothing showroom. But it just really goes to show how durable this product is, used in a retailer on 5th Avenue and many other cities around the USA. 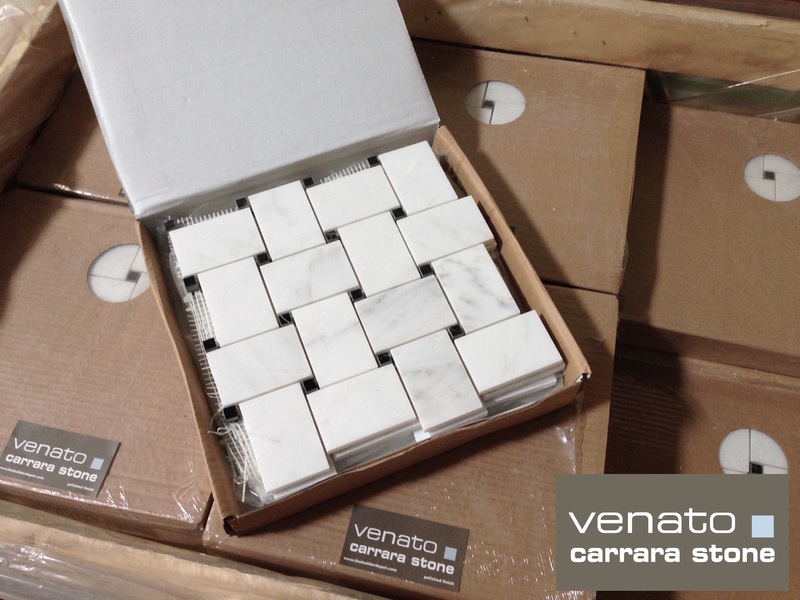 From another angle but again our Bianco Carrara 2″ Hexagon Honed for $11.25 a Square Foot. This picture is taken just as this NYC retailer opened. Their customers tare seeing incredible clothes on a floor that they believe is worth $50.00 a square foot or more as the average person understands marble to be this cost or higher. Terrible supply chains have made sure of this for over a half a century, until we came along and took it direct from the quarry to the consumer (or in this case major clothing retailer). Note: Picture taken with an iPhone and it came out well considering this is inside a retail showroom. These were not taken professionally by the retailer. Carrara Venato wide Basketweave Mosaic Tile with Nero Marquina Black dot available online from the Builder Depot for $11.75 a Sheet. An exclusive collection of over 200 products only available from The Builder Depot. New 2016 Video Starter chosen.